Since design thinking is so many things that experts and practioners can’t even agree with each other on a definition, at least you get to know what Design Thinking is likely NOT. And that’s extremely beneficial. Design Thinking confirms that design, as a process and as an output, has greater opportunity to add value to the triple bottom line than any other business function. 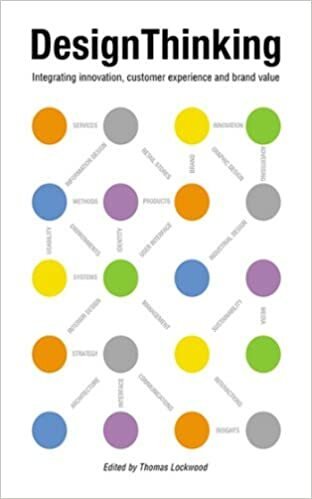 Ranked in the top 100 best seller list by Amazon in design, marketing, and communication book categories, Design Thinking explores point-of-views, techniques, methods, and hands-on case studies from international thought leaders. It covers design thinking methods; design thinking in service design; design thinking in brand building; and design thinking in creating customer experiences. The book includes insights by Thomas Lockwood along with 24 contributing authors. What’s the value of a 5-year-old book about design thinking? Perspectives. Lots of them. The concept of design thinking is as mythical as user experience, and that’s fine – both cover a lot of things. Design thinking is essentially a human-centered innovation process that emphasizes observation, collaboration, fast learning, visualization of ideas, rapid concept prototyping, and concurrent business analysis, which ultimately influences innovation and business strategy. The objective is to involve consumers, designers, and businesspeople in an integrative process, which can be applied to product, service, or even business design. …design thinking is primarily an innovation process. It is a way to help discover unmet needs and opportunities and to create new solutions. It is part of the “fuzzy front end” and is also being adopted to help reinvent businesses, as in solving “wicked” problems and business transformation. Design management is primarily the ongoing management and leadership of design organizations, processes, and designed outputs-products, services, communications, environments, and interactions. Design leadership and design strategy may be viewed as outputs of effective design thinking and design management. Generally, design management and leadership lie in the area of integrating design into business and in continuous development and improvement, whereas design thinking is more interested in front-end innovation and radical improvements. …particularly interesting was the need for design managers to work in cross-functional teams, develop deep user insights, collaborate, visualize ideas, and actually solve customers’ problems rather than just apply branding or fancy design styling. …product design is generally about the object, whereas service design is about the journey. In service design, it could be argued, alignment is more important than ideas. It may require new touchpoints, new technologies, new relationships with customers, and new revenue models. Although design thinking readily applies, service design often requires new methods of design management. Because people have been using similar or exactly the same methods, techniques, processes, and philosophies since time began. Although coming up with a fancy new name and building up some buzz around it is nothing to be ashamed of, sometimes the concept itself is indeed somewhat overrated. If you ask any veteran designer, along with many practitioners in many other fields and/or industries, about those methods and processes, it’d mostly be like “duh?” There’s no secret to reveal (or hide), because it’s really not about secret. It’s always about mindset, thinking process, corporate culture, and ideology/philosophy. No magical methods and processes can save anybody. Edgar Schein and Peter Drucker are the ones we need to look to as the first step. I do NOT believe in the concept of design thinking, I DO believe in its implications – a culture of collaboration, a culture of analysis and synthesis, and a culture of both creative exploration and uncompromising measurement. How do we approach design thinking? Three things: service design, corporate culture, and design synthesis. The methods and techniques mentioned in design thinking are likely to be within service design. To effectively and efficiently adopt new things in an orgnization, we need to know how to apply the methods and techniques in the context of the current corporate cutlure. There’s simply no guaranteed way to just copy a process or method and get the intended results. Corporate culture and how we work evolve together. Design synthesis heavily overlaps with service design and design thinking. The process for facilitating synthesis is at the core of daily work, so we need to take a closer look at how we can do that in a systematic way. A high-level, philosophical overview of what design means to us and to the world. This is to understand the “design” part in “design thinking”. Want to know how to apply or introduce design thinking (or any other thing) to the orgnization? Start from here. Concise big picture overview of the discipline, which promotes system thinking – exactly the same thing that’s at the core of design thinking. Many useful methods and techniques can be found here. Brainstorming, collaborating, designing, planing, building, everything covered. A practitioner’s guide to the methods and theory of design synthesis. A flawed but enlightening book with extremely deep insights about the process that can facilitate innovation.